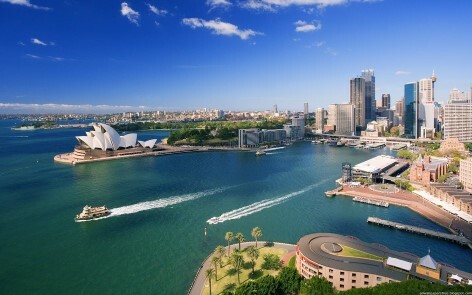 Sydney to Blue Mountains Tour: Sydney, a sprawling city, is one of the most popular travel destinations for everyone arriving in Australia. It’s beautiful beaches, mesmerising architecture and laid-back atmosphere is reason enough to stay for an extended holiday. It is simply a great sightseeing oasis. However, after a little while most people start to wonder what is outside the metropolitan domain that excites millions of tourists. Sydney is the perfect starting point for a variety of breathtaking adventures that can be conquered. 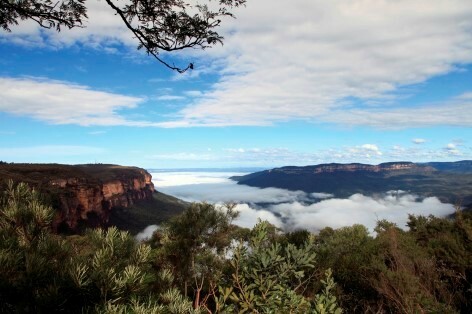 For one thing, the Blue Mountains are a convenient destination for a city escape. It is just 60 km from Sydney. 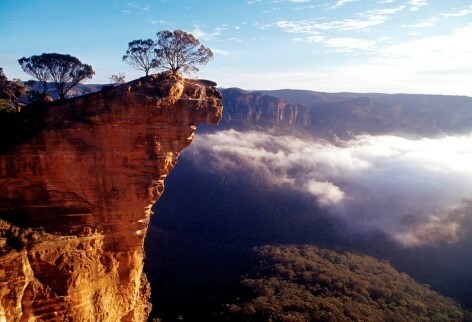 For that reason you can easily reach the best things to do in the Blue Mountains in 90 min by campervan hire. Sydney to Blue Mountains Tour – Just a 60 min drive! A Sydney to Blue Mountains tour is the perfect road trip for everyone that loves a spectacular landscape. 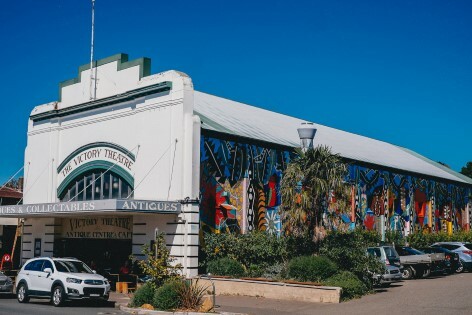 If you want to know more about things to do in the Blue Mountains continue reading. 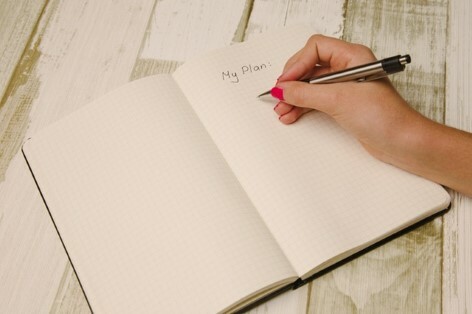 We have compiled a list with the best attractions and activities in the area. Incredible rock formations, lush eucalyptus forests, abundant wildlife and impeccable waterfalls are waiting for you to be explored. 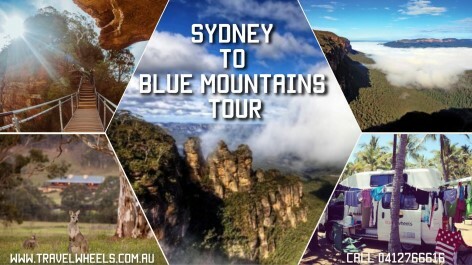 In short, it is time for you to start your Blue Mountains tour with a campervan hire Sydney! For any questions or a cheap deal for a campervan hire feel free to call us on 0412766616 or send us an email at [email protected]. 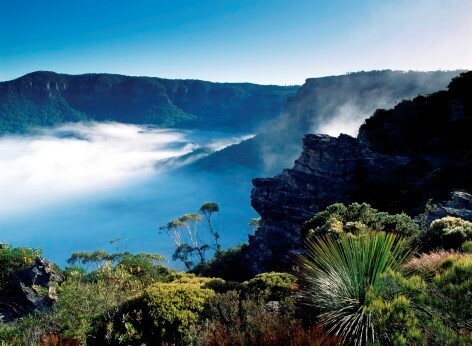 We are more than happy to plan your very own individual Sydney to Blue Mountains Tour. Let’s make it an adventure of a lifetime! Remember to bring a warm jumper. It can get quite chilly on a Sydney to Blue Mountains tour. Especially in winter the average temperatures drop to 3-15°C. During the summer month you can expect anything between 15 and 25°C. If you are lucky you might find some of the Upper Mountain region covered in snow. However, even though the Blue Mountains have some cooler days there are only 5 snow days per year. 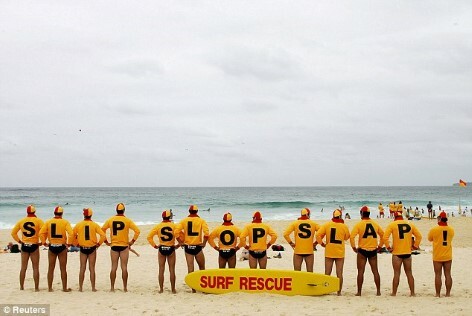 “Slip, slop, slap and wrap” is key! What is taught all Aussie children at a young age is just as important for grown-ups. What it means is: “Slip on a shirt, slop on sun cream, slap on a hat, and wrap around sunglasses!” Even though you might think that the thick forest at the national park offers enough shade, it is highly recommended! Slip slop slap! Don’t get sun burnt! 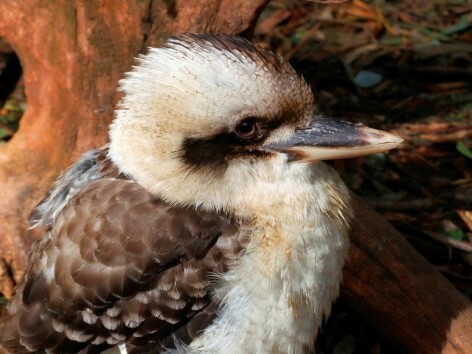 Best things to do in the Blue Mountains is taking binoculars for close-up views of birds and other wildlife. If you love taking pictures this is the place to bring all your best camera equipment! Make sure it is fully charged as you will get many beautiful shots! Eventually, you might like to tag us on Facebook or Instagram. Public and school holidays as well as weekends can be busy. Plan ahead to save yourself a top notch campsite spot for your campervan hire Sydney! 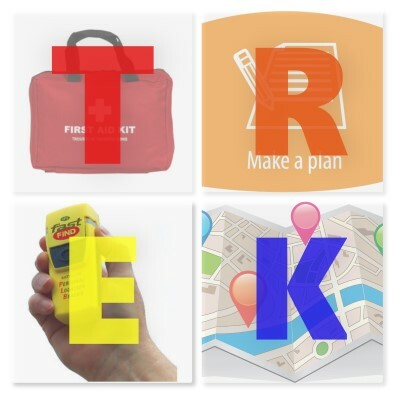 If you plan a longer hike through the rough wilderness of the Blue Mountains make sure to register your trekking route. Things to do in the Blue Mountains: Safety rules! Though most people only think of the Three Sisters when talking about the best things to do in the Blue Mountains we guarantee there is more! With more than 140 kilometers of hiking trails a Sydney to Blue Mountains tour has much to offer for nature lovers! Your campervan hire Sydney will guide you along a variety of historical and natural attractions. The Sydney to Blue Mountains tour is somewhat of a tourism hotspot. Expect adventurous activities like caving, abseiling, rock climbing and canoeing. 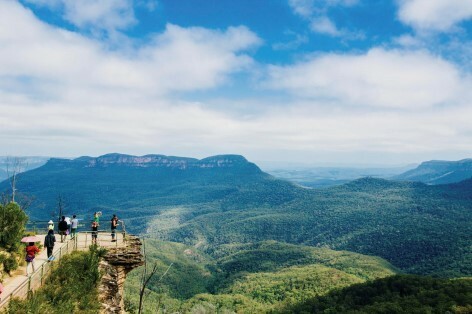 Additionally, the best things to do in the Blue Mountains include impeccable nature walks, beautiful picnic areas and relaxing swimming holes. 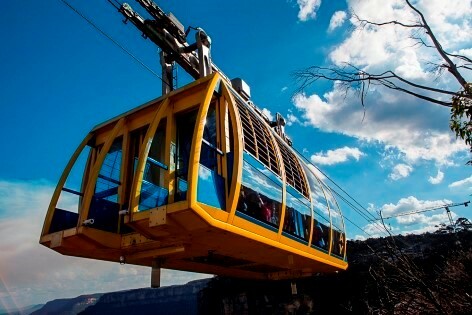 Everyone looking for a less sporty excursion will love a visit at the Scenic Railway, Scenic Cableway and Scenic Skyway. 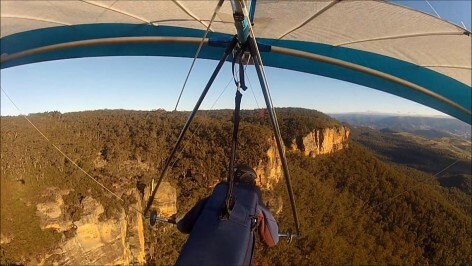 This is another way to see some of the impressive highlights the Blue Mountains have to offer. Let’s talk about our top things to do when on a Sydney to Blue Mountains Tour. 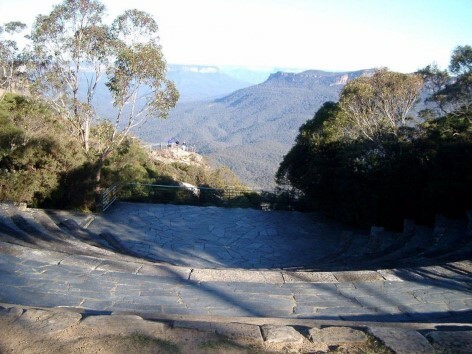 Blackheath is a great place to take your campervan hire when exploring the Blue Mountains. Further, you can find several campsites in the area, some are even for free like the Perry’s lookdown campground. The town itself has a very relaxing atmosphere and is great to fuel up for many nearby adventures. Check out the Victory Theatre. Imposing sandstone cliffs of Mount Banks make Perry’s Lookdown so spectacular! Take a deep breath of the fresh Blue Mountains air and take a break from the busy city life! This peaceful lookout is also a gateway to the historic Blue Gum Forest. From here you have the shortest but steepest descent into the famous forest. About 100 years ago this area was bought by nature-lovers to preserve it for future generations. A nice walk if you are near Perry’s Lookdown, and worth doing before Pulpit Rock lookout. This hike is a well hidden gem and not as busy as many other tourist magnets of the Blue Mountains. The view across the valley is jaw-dropping. Anvil Rock offers a perfect scenery for a romantic picnic. The lack of crowds makes it all the more attractive. Pulpit Rock is a very dramatic rock jutting out of a cliff. Far away from popular tourist hotspots it is a great place to unpack your lunchbox. Enjoy mesmerising 240 degree views across Govetts Gorge and the Grose Valley. in fact, the lookout is just a 400m walk from the carpark. 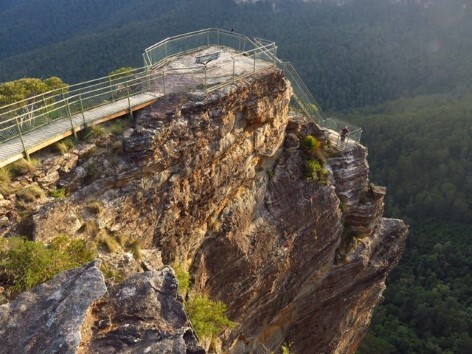 However, you can also couple it with the Govetts Leap or Evans Lookout tracks. 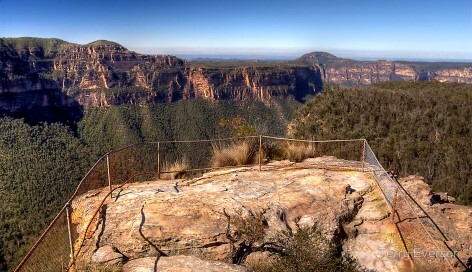 Govetts Leap is the second most popular lookout in the Blue Mountains. (The first is Echo Point and its Three Sisters.) Therefore take your campervan hire Sydney to this most spectacular-looking valley and prepare for landscape views beyond comparison. The majestic Govetts Leap waterfall is certainly a highlight, being the highest in the Blue Mountains at 180 meters. 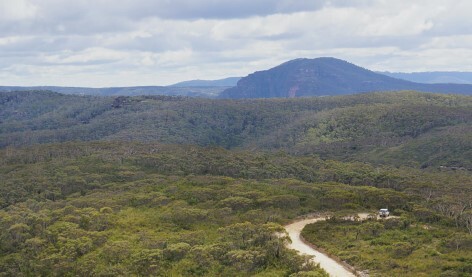 The amasing Evans lookout offers breathtaking views towards Grose Valley. The impeccable outlook is most glorious during sunrise and sunset. This is when the sandstone cliffs illuminate in bright orange colours. Just 4 km from Blackheath this free attraction can be a great starting point for one of the exciting bush walks in the area. For instance, the Cliff Top walking track will get your heart pumping. When wandering along the cliff edge from Evans Lookout to Govetts Leap lookout you are in for some pretty cool landscape views! At the same time Grand Canyon track offers an adventurous trekking experience! The great thing about this challenging loop walk is that you don’t need specialist hiking equipment. Even though you will conquer thrilling sandstone walls, ever-present waterfalls and abundant native plants, all you need are comfortable walking shoes. This route combines some of the finest lookouts above as well as some further hidden treasures of the Blue Mountains National Park. The hassle-free driving tour is a perfect opportunity to explore the western region. 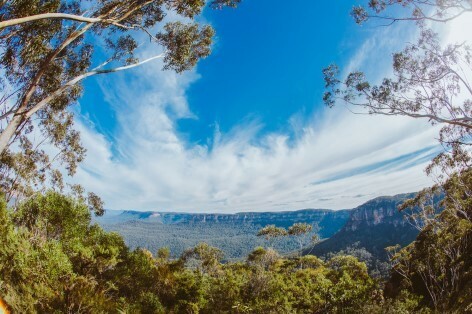 Some of the best things to do in the Blue Mountains await you. Hence, it is a must do when on a Sydney to Blue Mountains Tour. Stop by Hargraves and Mount Blackheath lookout and watch hang gliders colourfully embellishing the sky above an outstanding nature scenery. These million dollar views make a Sydney to Blue Mountains tour especially unforgettable! Sublime Point lookout is the best attraction in Leura to start off with. Sensational scenic views of Jamison Valley make it a superlative lunch spot! It will feel like the edge of the world when crossing the bridge over an impressive canyon to get to the platform. Take you binoculars with you! You will not only get a great view at Katoomba and the Three Sisters but many bird species such as the yellow-tailed black cockatoos. A stop at these wonderful waterfalls is a must on a Sydney to Blue Mountains Tour! Since it has a great picnic area, a kids playground and sensational views, it is a popular family day-trip destination. The 200m deep waterfall surrounded by a rich flora and fauna offers plenty for all ages. Another great picnic spot is located near Leura Cascades. With a perfect backdrop this place is ideal for a cool photo shooting! It is also start point for many beautiful hikes through thick eucalyptus forest. One of which will guide you all the way to the famous Echo Point. The site has a long history of entertainment use since the early 1900’s. When there is no function or event going on, the wonderful lookout is accessible by visitors. Expansive views across Jamison Valley make it easy to understand why this location is so popular for weddings! If you are up for more thrilling cliff views check out Elysian Rock Lookout & Cliff Top Bushwalk. Both hide just behind the amphitheater. 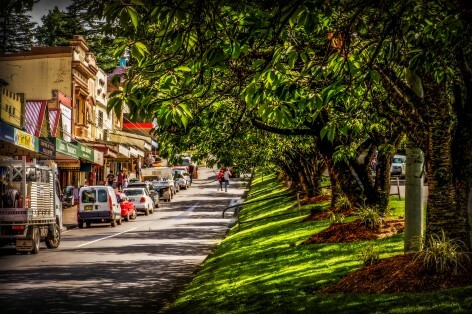 Before heading to Katoomba why not check out the Mount Hay Road. It is great for a day out in the Blue Mountains! As a result of exploring the area, you will discover many more walking tracks, wildflowers and breathtaking views. For the most part these are hidden gems and no tourists hotspots! Rock climbing and canyoning is a trendy activity in this region. However, it is highly recommended to have an experienced guide with you! 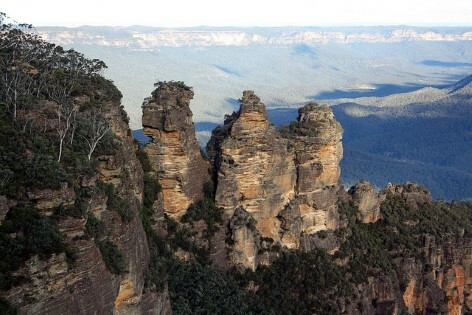 Here it comes, the most famous attraction on a Sydney to Blue Mountains Tour: The Three Sisters are best seen from the Echo Point at Katoomba. Even if it’s a misty day, this outlook promises unbelievable views! From this standpoint you will finally understand why the National Park is called the Blue Mountains. The reason why the forest seems to be covered by a blue haze blanket is the oil from those many eucalyptus trees. When combined with dust and water vapor it scatters short-wave length rays of light which are predominantly blue in colour. 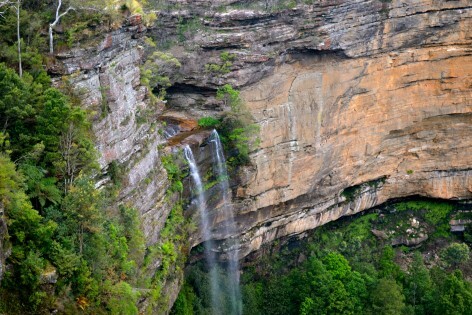 As well as Wentworth Waterfall, Katoomba Falls is one of the most scenic waterfalls in the Blue Mountains. 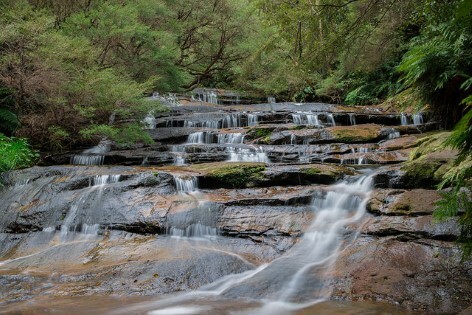 Make the most off your time and follow the Katoomba Falls Circuit Walk. This trail promises some wonderful lookouts and is a great workout at the same time. 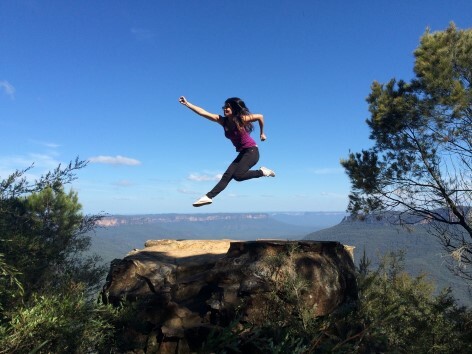 The Scenic World is also known as the ultimative Blue Mountains adventure! Therefore, take in breathtaking views from the steepest Scenic Railway that will take you right to a rainforest boardwalk in Jamison Valley. After exploring the Scenic Walkway return via Scenic Cableway. 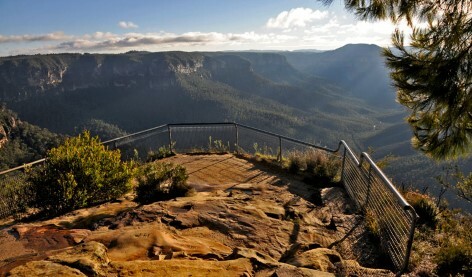 Splendid views of Orphan Rock, Mt Solitary and especially Katoomba Falls are waiting for you. To top it all up finish with the Scenic Skyway. 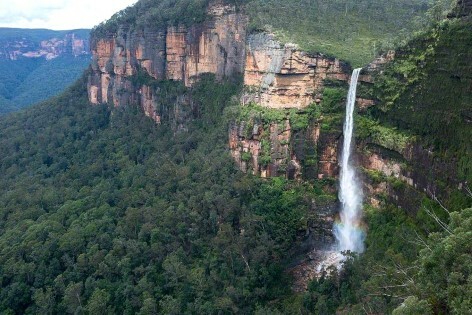 Expect some spectacular, and undoubtedly the best views of Katoomba Falls, the Three Sisters and Jamison Valley. What a great adventure! The Jenolan Caves are one of the most awe-inspiring attractions in the Greater Blue Mountains region. 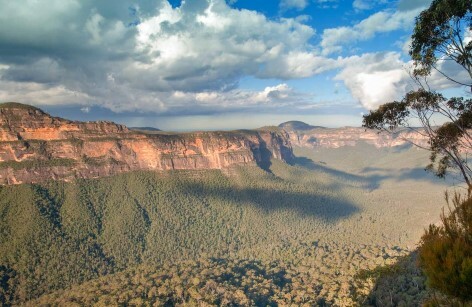 This astonishing place is located just 30km west from Katoomba. As a result it is the most visited group of limestone caves Australia’s. Our customer reviews highly recommend visiting this gem by campervan hire. Hence, it is a must do on our list of top things to do! 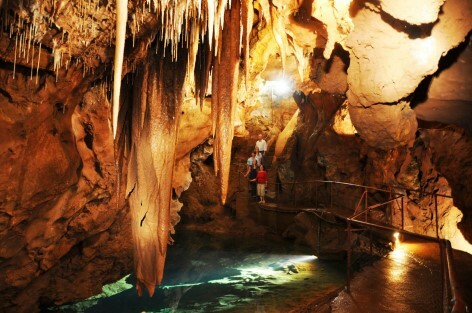 Consequently, try one of the many offered tours to get the most out of your trip to the Jenolan Caves. They even offer a self-guided multi-lingual tour for the more adventurous travellers to begin with. Furthermore, check out these highlights: Anyone who wants to add an extra bit of thrill to this excursion can participate in a Night and Ghost Tour or an Adventure Caving Experience. 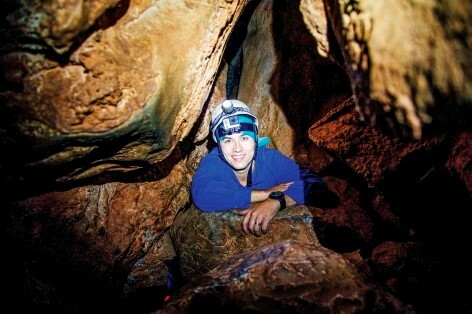 Climb through narrow limestone gorges equipped with only a headlamp so that you can light up your way through the dark! Hence, it is a great challenge! Especially when being claustrophobic, it requires a lot of mental strength. 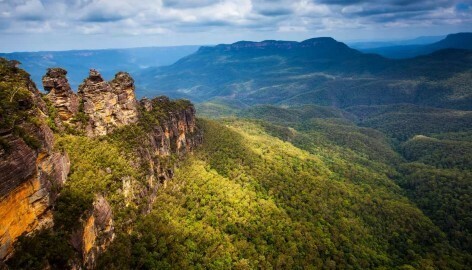 Do you want to know more about the best things to do in the Blue Mountains? We will update this page every couple of days. Get ready for more great tips and hints for an unforgettable campervan holiday! In other words, we got you covered! If you cannot wait until then feel free to email us at [email protected] Alternatively you can call us on 0412766616. In fact, we cannot wait answering all your questions! To get a cheap Sydney Campervan Hire quote fill in your dates below and receive an instant deal. Furthermore we beat every offer with our Price match guarantee!!! Hence, we offer the best value for money!